Every year thousands of marketers converge on San Diego for the world class Social media Marketing World. I am truly honored to speak at this event and excited to be returning as a 3-time alumni. 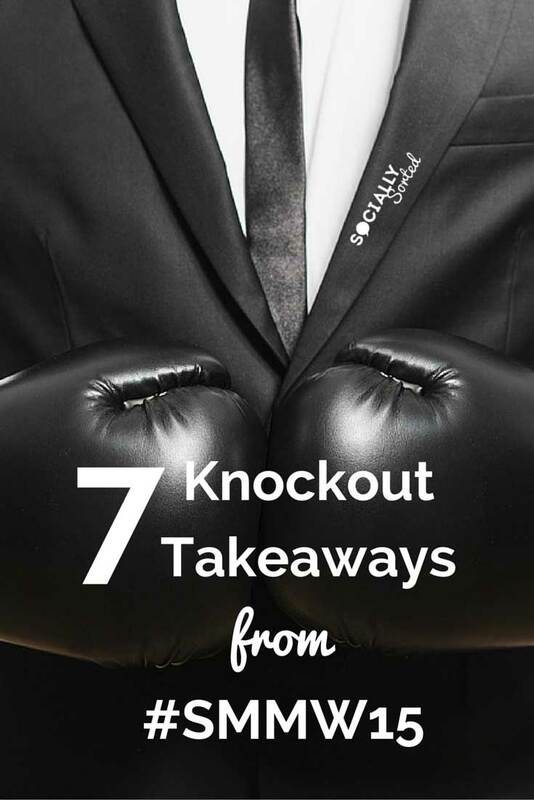 Here are my 7 knockout takeaways from the conference in 2015 – 7 things you need to know. If you want to attend Social Media Marketing World in 2017 – grab your ticket here (or your virtual ticket here!). From the start of Michael Stelzner’s opening keynote we witnessed an avalanche of tweets, posts, instagram snaps, pins and moments throughout the event. #1 Video is Hot… in any format! Michael Stelzner yet again started the event with a bang in his keynote, dazzling us with cutting edge statistics about social media – what’s working, what’s not and where we are headed this year and beyond. There were some repeat players from last year and some new finds. Michael made a BIG point about video being HUGE in his keynote. Not only is YouTube video here to stay but native embedded video on Facebook is going to be massive. Michael called it an “untapped frontier” and I believe he is right. 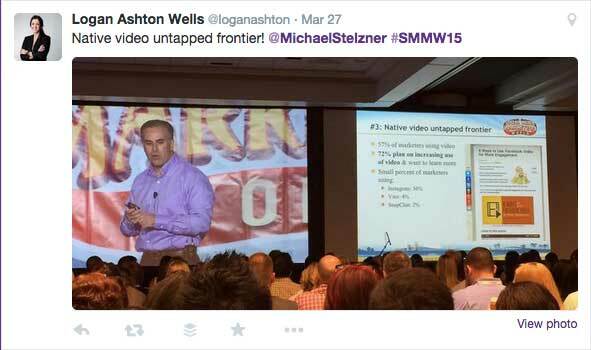 Michael Stelzner opens Social Media Marketing World with a bang. And if you don’t feel up to the challenge of long form video feed, then be sure to check out short form video: on Instagram with 15 second videos, on Vine with 6 second videos and by using new tools like Twitter’s Periscope, where we can live stream our lives (and businesses). In short, don’t leave your video opportunity on the table – if nothing else grab your smart phone and start creating using one of the awesome apps available. In my session on Visual Content I talked about tools like: Videohance, Hyperlapse, Stop motion studio and more…there is so much you can do with a smart phone! My session on the Thursday morning was all about Visual Content – specifically how to create a visual content strategy that works. There was an underlying message that I wanted to get across: Visual Content Drives Traffic.. and sales. Visual content that gets results, that drives traffic, can result not on in engagement, but in subscribers, customers and repeat customers. It can result in sales. 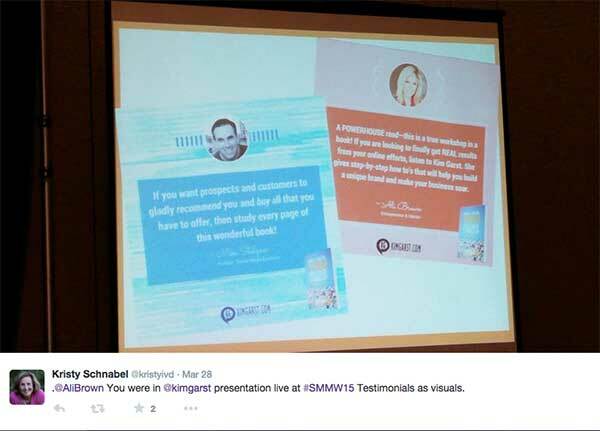 Kim Garst also presented on Visual Content and specifically how to use visuals to drive sales. As Kim pointed out, Social is about selling too. If you have a product or service, then capture the testimonials you receive in a visual format and post them on social channels. Kim sold many copies of her new book directly as a result of image testimonials posted on social media. 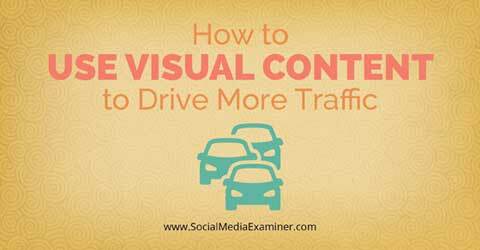 How does Visual Content work so well for social selling? Simple – it catches our attention, and compels us to take action. In my session I talked about how it can be used to set you apart from other businesses in your industry. 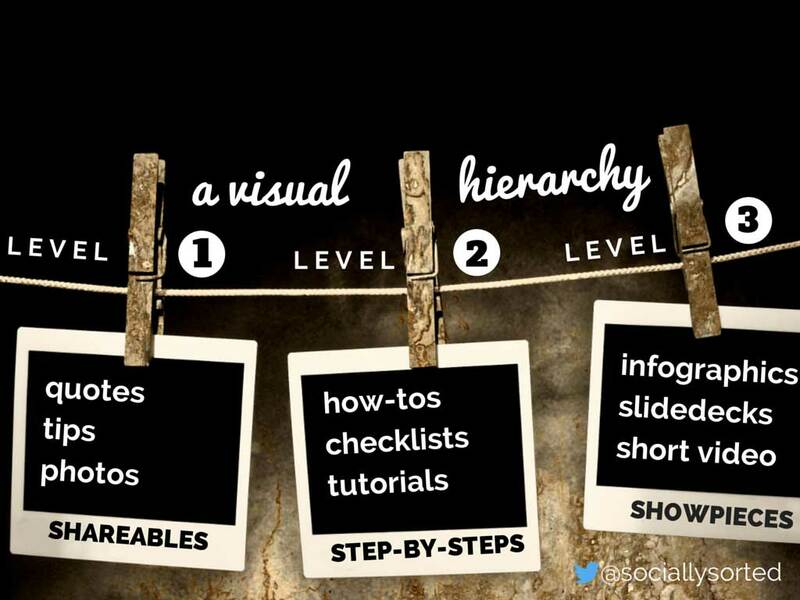 I shared a hierarchy of visual content that you can use to find a “jumping in point” to get started. At each level of visual content, the investment of time and money may increase but so does the return on engagement, traffic and sales. I also gave this challenge to the people in my session. Work out which level you are at, and then take action on creating some visual content that will take you to the next level. For example, if you are already using images and photos, then perhaps set a goal to create a checklist (do you know a system or procedure that you can share?) or a snackable infographic or slide deck. We had 3D glasses in my session to encourage people to take them home, sit them by their desk and start to think about their content from a visual perspective. 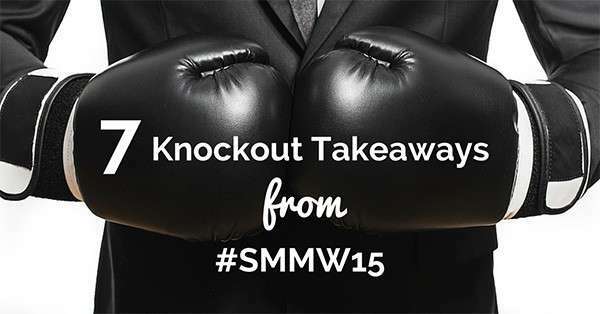 What will you take action on from #SMMW15? PS If you have access to the virtual pass you can find a special link during my session – it includes all of the tools, links, resources and articles that I mentioned – including a free (and awesome) canva template to create your own infographic. It’s exclusive to people attending the session or on the virtual pass… so be sure to grab it by watching my replay here. I was excited to hear Michael Hyatt speak this year – as a blogger, I struggle with the idea of consistency vs quantity. I usually post once per week but struggle with doing more than that (2 or 3 times per week). When I do manage to do more, I often can’t keep up. Michael talked about how he experimented with dialling back his posting from 5 times per week to 3 times per week and his traffic barely changed after an initial drop. He highlighted how just one post a week, published consistency, might be the minimum effective dose of content needed to get traffic and readers. Consistency builds trust and builds your platform. Like Michael says, Consistency is more important than Frequency. After Michael’s timely advice, I will be sticking to what I am doing, creating more detailed, helpful, valuable posts for my readers, and only increasing the number of posts… IF I can maintain that consistency. Because consistency is more important than frequency. Holly Homer runs a highly successful Facebook Page for her business, Kids Activities Blog. Her session was a must-see for me, as she has built a huge level of engagement on her page – much higher than the average Facebook page. On the topic of search, Vincent Ng gave some hot tips about guided search. He advised that you use the Pinterest search bar for keyword ideas and customer insights. I loved how many of the speakers mentioned Tailwind App – it’s my go-to tool for pinning. 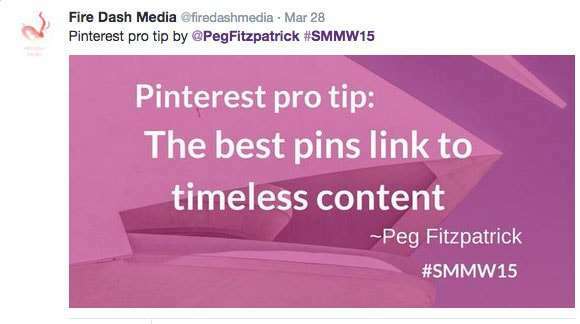 Trust me, after trying Tailwind, you won’t know how you ever managed to pin content without it! During my session, I recommended that you focus first on optimizing your images on your website so fans can easily find and share your visual content to Pinterest. You can do this by having Portrait sized “Pinterest-friendly” images on every page, and header images with text overlay to add context when the pin is separated from your website on Pinterest. With so many great sessions on Pinterest, it has re-invigorated my love for the visual web. I hope you are inspired too! In my session I talked about the importance of native, visual content across all platforms. You need to take a step back, look at what is resonating with your fans, and also what YOU like to see posted on your primary social media networks… then start posting that type of content. Stop posting like a marketer and start posting like a fan. I talked about how on Facebook, your fans don’t come to buy your stuff (sorry, it’s true!) but instead they are there to hang out with their friends and family and be entertained. On Facebook, visuals like quotes, images (behind the scenes and funny photos) and especially nostalgic photos work a treat. Why else do you think we love #ThrowbackThursday? On instagram it might be different – Instagram users are there to share moments in their lives with images. While on Pinterest they may actually want to buy things – or at least to aspire to buy things. No matter what type of platform, you need to take time to understand the “native” content of that platform. Another example of native content achieving big things was highlighted by Kim Garst in her session on visual content. Kim gets huge organic reach by posting a lot of native visual content – especially original visual content. She also highlighted the power of a tool that I love too – Post Planner. In particular she talked about how Post Planner helps you find “proven” content to share. You can either curate the content of others or use it as inspiration to create your own content based on what is already working. I highly recommend you check out Post Planner and take a free trial to test out their Viral Photo tool – it’s a great way to find visual content that is already being shared well on other pages… which you can then share too. And remember… take off your marketing hat. Step into the shoes of your fans. Then post like a fan, not a marketer. I was excited to see that the final keynotes for each day were about customer service and how important it is. John DiJulius, a “Customer Experience” expert was amazing on Day 1 and Jay Baer rocked the house in his final keynote to round out the end of the conference. Both of these smart guys presented on how to give your customers – even your haters – an amazing customer experience. 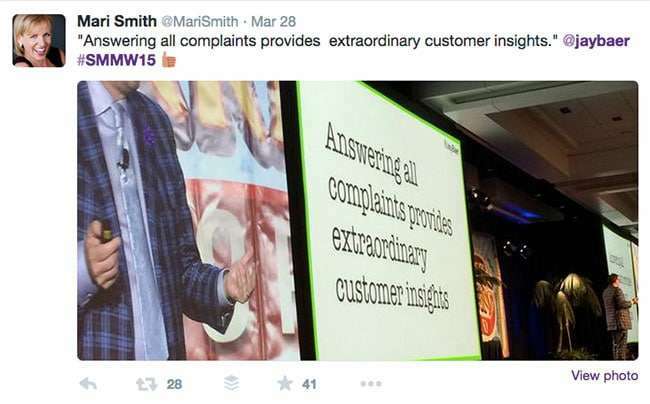 Yes, it is possible to turn your complainers into raving brand advocates. Jay said so. And he said it convincingly with awesome case study and a barrage of memorable tag-lines! 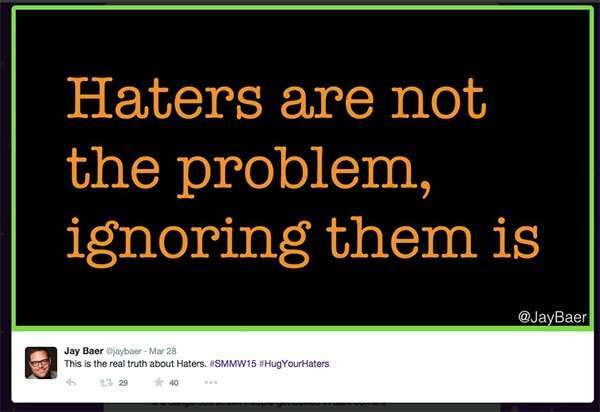 The entire audience now can’t wait for his new book to come out, titled Hug Your Haters. And let’s take another look at this from a different angle as it really is something we need to take in (and because this is an awesome shot by Mari Smith!). Not surprisingly, when you break it down, Facebook is the main location our customer’s need to be heard! 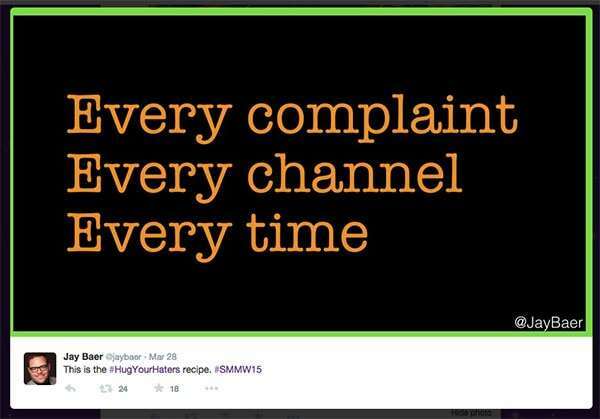 If you follow Jay’s simple advice, then your most seasoned complainer, might just become your biggest fan! Were you there with me? 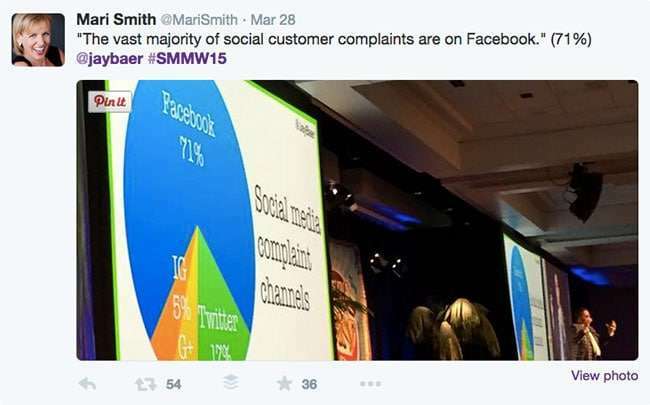 What were your biggest takeaways from Social Media Marketing World? And if you couldn’t make it … will you join me next year?